Rakuna, a groundbreaking campus and event recruiting solution that helps HR companies streamlining their hiring processes, announced the release of its mobile app on Android. Following the successful launch of our iOS app, we are delighted that our product now finally comes to Android users. 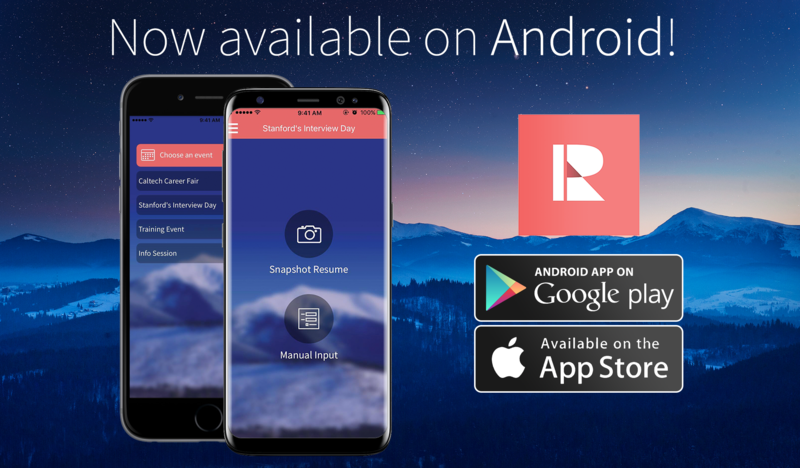 From now on, recruiters with a smartphone using Android operating system can easily take snapshots of all candidates’ resumes, manage and retrieve prospect’s data in seconds and qualify them in real time at career fairs and on-campus recruiting events. The app also features round-the-clock online and offline support. Rakuna Recruit app is an effective campus recruiting solution for recruiters who have trouble handling stacks of paper resumes and managing candidates’ information amidst the constant travel between campus recruiting events. Thanks to Rakuna Recruit, recruiters can capture resumes and evaluate candidates instantly, quickly track prospects’ data on management’s dashboard, and manage all recruiting events all in one place. Technology keeps moving forward and we never stop enhancing our product for better user experience. In addition to the launch of Rakuna Recruit on Android, we also roll out a list of awesome features focusing on integration and deeper insights for recruiters. This release includes Rakuna’s bulk-import capability for iCIMS and Greenhouse ATS, multiple-page resume uploads, and messaging status. We understand the challenges of managing data across various systems and the wish of aggregating data into companies’ central ATS in an easy and seamless manner. After a year of partnering with iCIMS and Greenhouse, two of the most innovative ATS providers out there, we are happy to upgrade our integration to include bulk-import capability. This new feature will save extensive time for recruiting teams and allow for central data management. With this new update, recruiters can have up to four snapshots representing four pages of a candidate’s resume instead of being able to take only one photo of a resume as in older versions. Click: The pinnacle of email engagement is the click. Your call to action, whether it is to ask candidates to apply on your ATS, or sign up on your Talent Network. If your email has a hyperlink, Rakuna can track if the recipient clicks on the link and visits your website. Check out Rakuna Knowledge Base for more awesome updates. Rakuna is the campus recruiting platform redefining how top employers recruit young people. The Rakuna Platform includes Rakuna Recruit, the simplest mobile app for career fairs and recruiting events, and Rakuna Recruit Dashboard, the candidate relationship management dashboard for campus recruiting. We are how companies hire millennials. To learn more, visit: http://www.rakuna.co.